You want to have your data backed up in an external location. This requirement is a reasonable way to ensure all the EMRs are safe. Note how many of these requirements are probably already in place for your company. Very little is required additionally to the security parameters that most enterprises and many SMBs already have up and running. Again, hosting services must meet this and the other HIPAA compliant hosting requirements as well. Offsite backups are a security tactic and disaster recovery technique that means data, and in some cases software, is being stored at a remote location from the company. Offsite backups are also called offsite data backups or offsite data protection – albeit, the latter really denoting the safeguards of the external environment. 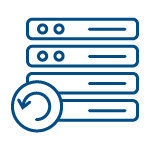 Offsite backups are simply a distribution or diversification method to prevent total loss of your valuable ePHI (electronic protected health information).